When you stay at Auriga, you get a whole lodge, not just an apartment. You can prepare your own meals in the kitchen, hang out in the garden or just kick back in the hammock and pass the day away. The lodge has two, double-bed bedrooms. Please note the building is a less then normal height because it is a converted horse stable. Groups of up to five people are welcome as well as naturists. Having an ecolodge on Bonaire with a semi desert climate is a big challenge……but also necessary. Bonaire is being promoted as “Unspoiled, Unhurried, Unforgettable”. Unfortunately the “Unspoiled” part is not true. 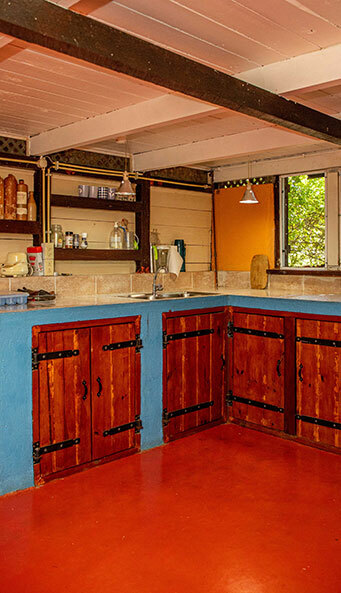 So……it's about time there is an ecolodge on this beautiful Caribbean island. Staying here will have a minimum impact on the fragile ecosystem of Bonaire. We use solar energy, recycle as many products as we can, use your human “waste” and reforest (with endemic trees) on a specific terrain adjacent to the lodge. Our tours are emphasized on nature and we will explain everything you want to know about our ecosystems (and their disturbance) here on Bonaire. This is a continuous process and we are constantly working on improvements. Recently we have planted a lot of new trees and plants which were donated. Some were given to us by clients of the eco lodge. Others were a donation from "Salva nos Lora", who is being supported by the "Vogelbescherming nederland". The idea behind this is to plant more local trees and fruitbearing trees so the Bonairean Parrot has enough to eat. As at this moment a lot of trees are disappearing which are actually very important to these parrots, an endemic species on Bonaire. This way we hope to contribute to a more friendly habitat for our lora (yellow shouldered amazon parrot) and to increase the biodiversity in this part of the island. "We were delighted by the many local features and personal guidance that makes this place so enjoyable: the natural wind draft, the open eating area upstairs, the lazy hammock and chair for our 2 youngsters Viktor and Renate, and the outdoor shower (Renate's favourite). In the evening we often enjoyed the starlit sky from the platform. The kitchen was great to cook our lasagna, burrito's, salads…etc. The bookshelf was a great reading pleasure source..."